This stereotyped and oft-times-proven untrue description of ancient Hindu society has been promoted by Christians for centuries. By repeating it C.A. Simon shows that his interest in writing the article is not “purely academic”. He is championing a cause, and he has presented St. Thomas as the champion and pioneer of a cause — Liberation Theology. This new role for St. Thomas is absurd, and whatever the merits of the new ideology — and they are doubtful — neither Jesus nor his brother Judas Thomas can be presented as champions of the oppressed and downtrodden if we are to believe the Acts of Thomas. Its first verses record that Thomas was sold into slavery by the very Jesus whose “message of liberation” he is supposed to have brought to India. The Acts then describe how he enslaves the aristocratic women he converts and destroys their families. Finally we learn that this is the reason that King Mazdai of Parthia has him executed — and it is a good reason. C.A. Simon seems not to have read the Acts of Thomas or heard the traditional Syrian Christian version of the apostle’s “good works” in India. In one of these tales St. Thomas only accepts Brahmins into his new creed — with the curious exception of one barber convert. This isolated soul is never given a place in the Christian community even during the apostle’s lifetime, and to present St. Thomas as a champion of the poor is ironical, even grotesque — but then Liberation Theology itself is proving to be just another means by which the Church can further exploit the faithful. Indeed, the exploitation of the faithful has been going on from the very beginning. St. Paul returned the runaway slave Onesimus to his rightful owner Philemon — the Epistle of Paul to Philemon being the covering letter he sent with him — and St. Thomas is depicted in art with two slaves, two lions and a cloak of peacock feathers — hardly an image of a servant of the poor! Today the number of lower caste converts to Christianity is myriad and they are no more accepted by their upper caste brethren than was their mythical first century barber ancestor. The plain truth is that the Churches of India are riddled with caste and to highlight this situation, Scheduled Caste Christians demonstrated against the untouchability practiced in the Church when Pope John Paul II visited India in 1986. They probably did not know that Pope Gregory XV (1621-1623) had sanctioned caste within the Indian Church and that his edict has never been rescinded. Earlier in 1599 the Council of Diamper and again in 1606 the Council of Goa had sanctioned the same. These sanctions have governed Catholic practice ever since — though Christians piously maintain that caste is contrary to Christ’s teachings. No self-respecting Scheduled Caste Christians will ask the Government to include them in the Scheduled Caste list. Is it not shameful for the Indian Church, even after centuries of Christian tradition, to say that it has a vast majority of untouchable Christians? I myself come from a state where Christianity reached in the first century itself before it went to Europe, and that state, Kerala, the highly literate state in India, has more than 35 lakh untouchable Christians out of a total population of 51 lakh Christians. But these majority Scheduled Caste Christians do not have any voice in the Church administration and in the ecclesiastical structure. The Christian population of India is just 3 per cent out of the 800 million total population of India, and 85 per cent of the Christians are from the Scheduled Casts and Scheduled Tribes. The Scheduled Caste Christians, instead of asking for reservation on par with the Hindu, Sikh and Buddhist Scheduled Castes, should demand that the Indian Church implement reservation first in their home itself. Charity should begin at home! The Indian Christian Church has the best educational, technical and medical institutions in the country and it is unfortunate that the presence of the untouchable Christians in these prestigious institutions is worse than anywhere else. Why is the Indian Church blind to this brutal injustice and discrimination committed to its own family members? While the Indian Church enjoys the minority rights guaranteed in the Constitution it violates the legitimate human rights of Dalit Christians. Instead of begging the Government, the Church must render justice to her own — least brothers and sisters — by sharing power and wealth with Scheduled Caste Christians in proportion to their population. The Church must respond to the cries of the Dalit Christians. Once justice is established at home the Church can put pressure on the Government of India to get the Constitution amended to help Scheduled Caste Christians to get the constitutional rights enjoyed by their Hindu, Sikh and Buddhist counterparts. This letter — in places self-contradictive — shows an insensitivity to the position of Hindus and ignores the financial privileges enjoyed by the Church. Christian religious and educational institutions are fully autonomous and collect large foreign donations, unlike their Hindu counterparts which must accept state-controlled administrations and finance. That these foreign moneys collected in the name of the Scheduled Castes almost never reach the Scheduled Castes, is the cause of on-going scandal in churches of every denomination. Mr. Raju Thomas may assert that he comes from an Indian state where Christianity was established in the first century C.E. (I.E. Aug. 2), but he must know that his claim has never been substantiated in history. Even the generous K.S. Latourette, in A History of the Expansion of Christianity, does not allow the possibility of Christians coming to India by any route before the third century C.E. The consensus among most historians who do not have a theological axe to grind, is that the first Christians to arrive in India, landing at Cranganore, Kerala, came in 345 C.E. They were four hundred refugees belonging to seven tribes of West Asia, who were fleeing religious persecution by the Persian Shapor II. Their leader was a Syrian who is known to history as Knae Thomman, Thomas Cananeus, Thomas of Cana, or Thomas the Merchant. It is probably this man whom the Syrian Christians later converted into the first century apostle-martyr St. Thomas. Though the myth of St. Thomas coming to Kerala in 52 C.E. was invented by Syrian Christians, it was resurrected and embellished in the sixteenth century by Jesuit and Franciscan missionaries who needed a pious story of persecution to cover up their own persecution of the Hindus. During this period they and their Portuguese masters destroyed the great Shiva temple on the Mylapore beach, the Murugan temple on Little Mount and the Shiva temple on Big Mount, and built Christian churches on the ruins. The Roman Catholic Church continues to promote this vicious tale as part of her ancient effort to vilify Hindus and malign Hinduism—and, of course, to support her religious and political claims to India. Those interested in the ongoing campaign may refer to an excellent article by Swami Tapasyananda called “The Legend of a Slain Saint to Stain Hinduism’ in the recent June issue of The Vedanta Kesari published by Sri Ramakrishna Math, Mylapore, Madras 600004. Thank you for the copy of your letter to the editor, Indian Express, Madras, dated 3 August 1990. I have been expecting that that letter would be published in the columns of the Indian Express. But so far it is not being published. I have already posted a long letter on this issue as many people have come forward with the same question about the existing of Christianity in the first century in the Indian subcontinent. Yes, Mr. Ishwar Sharan, I too agree with your views that Christianity did not exist in the first century in the Indian subcontinent. 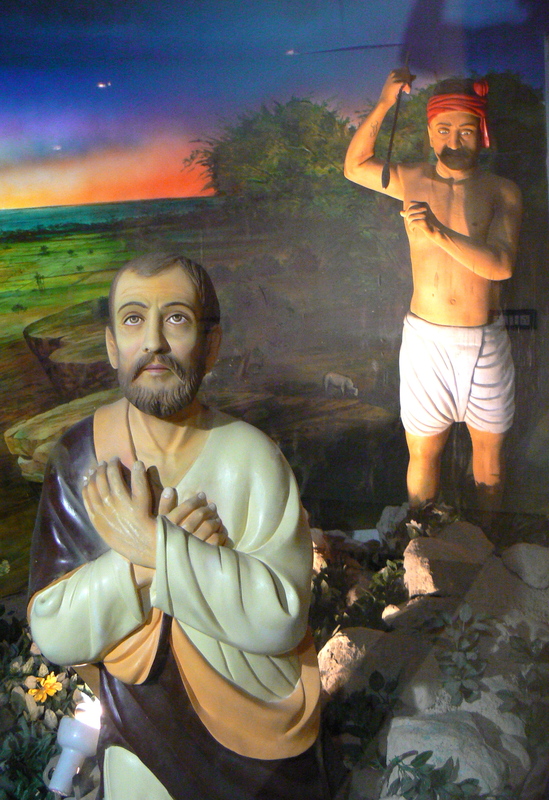 It is only a traditional belief that St. Thomas had come to India and converted the Brahmins to Christianity but this claim does not have any historical proof. However, this traditional belief of the Christians in Kerala is so deep-rooted that they relentlessly go on propagating it. You may ask me if such is the case, why did I too assert that Christianity had come to India before it had reached Europe? My answer to this question is that I deliberately wanted an open debate and discussion on this subject. But except a few nobody has come with challenging theories or written in the Indian Express. But why? We will be able to challenge and question such falsified histories and traditional beliefs only when we take up such issues to the public and do not keep them as the top secrets. But the question is: How many of our ‘intellectuals’ are ready to have open-minded debates and discussions? Our sole aim is to eat, drink, make money and enjoy. This is the Indian reality. How many of us take up discussion on issues? We are concerned about the pension, non-supply of water, not getting facilities in the buses and trains, etc. Is this what a healthy society is to think and debate? I do not know. I also agree with your opinion about the historicity of the Thomas Christians in Kerala in ancient Cheranadu. I also have some if not full soft corner towards your argument: “… this man whom the Syrian Christians later converted into the first century apostle-martyr St. Thomas.” I am sure provided much light is shed on this argument the truth will certainly come out. Do you know the real story of these Jerusalem Christians who had come to Kerala? Today their total number is 1,60,000 and 1 lakh within the Roman Catholic Church and 60 thousand in the Jacobite Church. It is also unfortunate that these Christians (?) do not maintain any kind of relationship with other Christians in India, no marital relationship, not giving baptism to non-Knaya Christians in their church, not allowing Dalit Christians in their houses, etc. They want to keep up the purity of their blood. In fact they are the worst enemies of the Dalits in Kerala. Your other remarks on the Franciscans and the Jesuits, etc., have to be seriously studied. I am interested in this kind of research works. But do we have sufficient documents? I am very much enthusiastic to get that article, “The Legend of a Slain Saint to Stain Hinduism” by Swami Tapasyananda, published in The Vedanta Kesari. Would you help me to get one copy of this? Thank you for writing to me. I welcome more enlightenment in these matters. I do not know whether the Indian Express will publish my letter which is a lengthy one. Thank you for the letter dated August 31st. You will have received by now Swami Tapasyananda’s article. He had originally submitted it to the Indian Express. They ignored it. After waiting three months he published the article in his own magazine. I, too, submitted an essay debunking the myth of St. Thomas to the Indian Express in March. It was a reply to C.A. Simon’s article which appeared in the Express Weekend last December. My submission was also ignored for months. Finally the IE resident editor rejected it in June with the lame excuse that he had no space and that I had already had my say in a letter published in the Express Weekend. My latest letter replying to your statement on St. Thomas, is only one of many sent to the Indian Express over the last eight months. Many others have written also and I have copies of their letters. None of these letters have been published. I am sure that your letter will also not be published. My long experience is that the Indian Express only publishes material promoting the myth of St. Thomas as true Madras history (excepting for the three edited letters which appeared in the Express Weekend early this year). The Indian Express consistently suppresses all material, no matter how well documented, that shows up this political tale for what it really is. So you see, Mr. Thomas, the “fearless Jesuits” in that editorial office are no different from your priests and our politicians. They are full of grand rhetoric and promises of salvation which it does not cost them anything to make. But the moment they perceive that the truth threatens their bank accounts and official positions, they are utterly ruthless in suppressing it and the persons who speak it. Gandhiji once said that it was cowardice that was the threat to our nation, not poverty. I believe he was right — again! As it is, I am blacklisted at the Indian Express offices and none of my letters are published any longer. This will please many of their Christian readers, for I am a long-time student of Christian history and a critic of Church politics and ideology. This should not be misunderstood to mean that I am hostile to Christians of faith. This is not the case at all. In fact I see the Christian layman as the first victim of Church politics. This is why I firmly believe that Christians activists like yourself must go to the Church for redress of your grievances before you go to the Government. To go to the Government is to let the Church off the hook. Why do that? What has the Church done for you really? The whole edifice of the Church is built on the emotional, psychological and material exploitation of the poor and ignorant. You know better than I do that the Church has vast quantities of foreign money meant for the poor which never reaches the poor. You also know that caste is fully sanctioned within the Church. So-called saints like Francis Xavier, John de Britto and Robert de Nobili all practiced untouchability — not to mention the fabled St. Thomas! There is one — perhaps two — papal bulls sanctioning caste divisions in churches and social relations. And there are the edicts of the Council of Diamper which sanction the same. To argue that caste is un-Christian is really beside the point. But to return to the original subject of this letter. My essay called The Myth of Saint Thomas and the Mylapore Shiva Templeis in the press but its publication has got delayed. It will be out in a month or so and I will send you a copy. You will discover that I make no statement and draw no inference that I cannot document. I am very happy that you have written to the Indian Express about this issue. And I am sorry that your letter will not get published. But because it will not be published I would very much like to have a copy of it, if you would kindly send me one. I continue my study of this myth and am always eager for new references and points of view. Pope John Paul II has reaffirmed that the Church is an autocracy not a democracy — and that he is the present autocrat. The reference is to the first edition of this book which was published in February 1991. The observations made here about the editorial policy of the Madras edition of the Indian Express are as true today — June 2010 — as at the time of writing the letter in September 1990. This entry was posted in caste, dalit, indian history, st. thomas and tagged benedict xvi, indian history, saint thomas, saint thomas christians, st. thomas & caste. Bookmark the permalink.